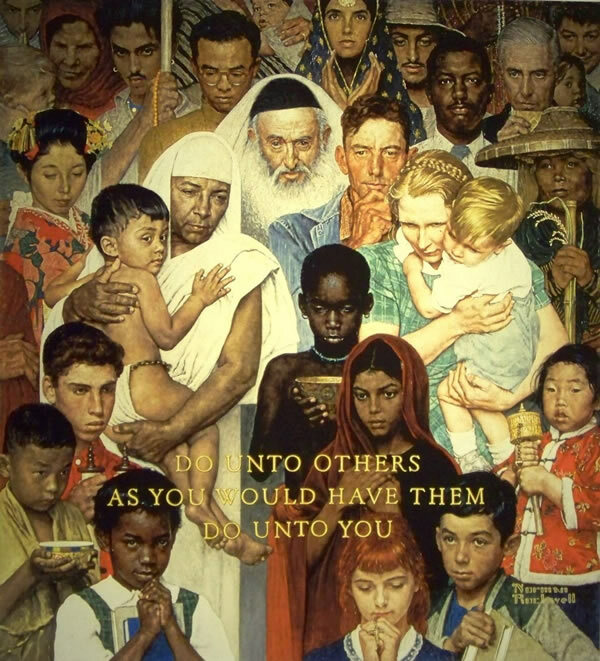 “The Golden Rule” (1961) by Norman Rockwell. It was my honor to work with you on this wonderful poem, and I am happy to see it published! Yes, yes, yes, yes, yes, yes, yes, and yes! Beautiful words, Freshta. May they be repeated, and heard in human hearts! Dear Freshta: I am sitting watching the birds at my feeder this morning. It is a cold morning in Michigan, and so they come to my feeder willingly. They look into my kitchen window when the feeder is empty. So I try to keep it filled. Your words take me to a feeder of the human heart in that I get nourishment from your words. They warm me on this cold day. And, your powerful thoughts give me wings to go out into the world and spread the hope you so willingly share. Thank you. The writer in me tells me to ask you to go back to your poem and give me some concrete details. Let me see, more specifically, what you see. I would like to read your writing again. This poem is a prayer. I love “keep the word human.” I plan to write this on my wall. Dear Freshta, thank you! For sharing your inspiring vision of the world. YES! Keep writing. You are being heard. Inspiring and beautiful! I will remember this one for a long time. It is wonderful to see how across the world people wish to fight against any form of discrimination. The world needs more people who will share their voice like you have! I really admire your writing style here. I think that this poem can speak to everyone, no matter who it is. I really admire the efficiency of this poem; simple, yet effective.